The Kilbride to Ferryland Family Resource Center Coalition Inc. is a community-based registered charitable organization y providing programs and services to families living in the Kilbride to Cappahayden geographical area. Currently, we have five family resource centers: two in Kilbride, one in the Goulds, a center in Bay Bulls/Witless Bay and another in the community of Ferryland. We offer a variety of programs and services to families with children 0-11 years of age, including drop-in playgroups, toy library, parent education and support groups, as well as a prenatal/postnatal support group program. All our programs are free of charge and available to all families living in our area. 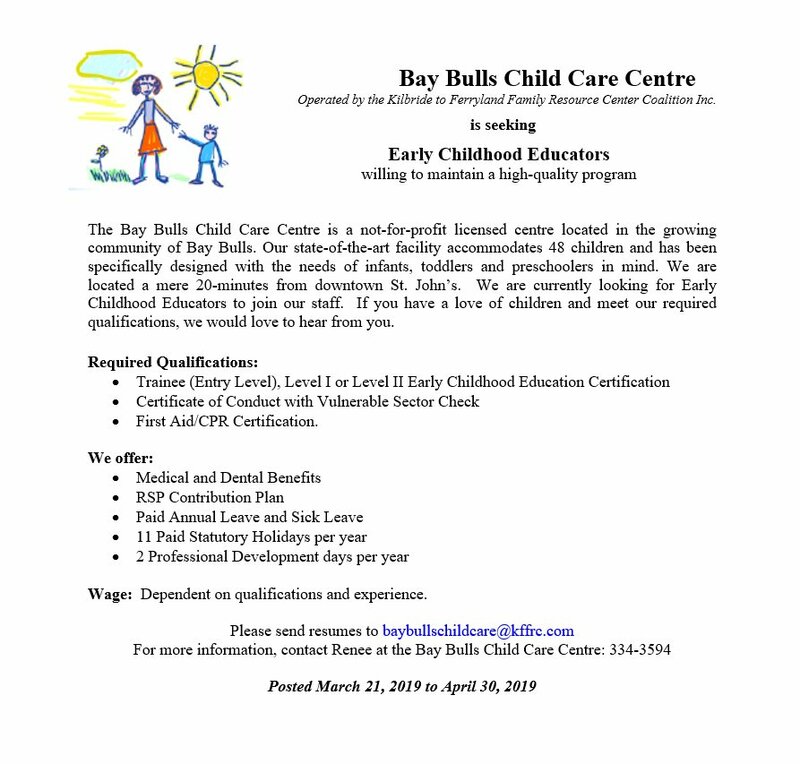 The Kilbride to Ferryland Family Resource Center Coalition Inc. has expanded its programming to include a licensed child care center in Bay Bulls. Please go to Child Care Center page for more information and any updates for the child care center. The Kilbride to Ferryland Family Resource Center Coalition Inc. receives funding through the Department of Education and Child Development. The Kilbride to Ferryland Family Resource Center Coalition Inc. also receives support (in-kind and financial) from various community partners, families and individuals.